FIRST CLASS PSYCHOLOGICAL SUSPENSE FROM A MAJOR NEW VOICE IN FICTION Margot Lewis is the agony aunt for The Cambridge Enquirer. Her advice column, Dear Amy, gets all kinds of letters - but none like the one she's just received: Dear Amy, I don't know where I am. I've been kidnapped and am being held prisoner by a strange man. I'm afraid he'll kill me. Please help me soon, Bethan Avery Bethan Avery has been missing for years. This is surely some cruel hoax. But, as more letters arrive, they contain information that was never made public. How is this happening? Answering this question will cost Margot everything . . .
Set in Cambridge this is a book by Helen Callaghan with an “educated tone”. Initially I found it interesting and an intriguing read. 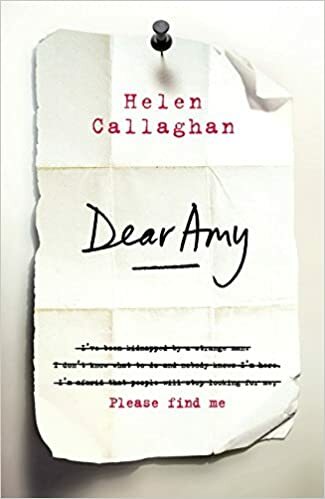 It’s centered on Margot, a teacher, who also writes an agony aunt column in the local press – Dear Amy. There is a letter from someone claiming to be the victim of an abduction from an unsolved case from some years to the agony aunt column. This leads to Margot being involved in a “Cold case” type review. I found this basic scenario appealing and was looking forward to reading this story. Having finished the book a few days before writing this review I am still a little unsure how I feel about the book as a whole. The pace and tension for maybe the first half of the book was lacking something for me. While we discover quite a bit about Margot and her personal life, there seems to be relatively little about the case other than the fact that it is quite probably relates to a serial abductor, I also found some of the characters in the book generally somewhat under written and developed. The exception is certainly Margot who in spells of introspection develops into a good character. For me the book changes quite radically about halfway through. The pace and tension brings the book far more to life, Around this time there is a very good twist in the story which I really didn’t see coming until maybe the paragraph before. It is this and the character of Margot, both aspects of which I think were very well written, that are the redeeming features of this story. I was not blown away by the basic storyline however I did find that this book grew on me. I’d certainly read another story by this author.